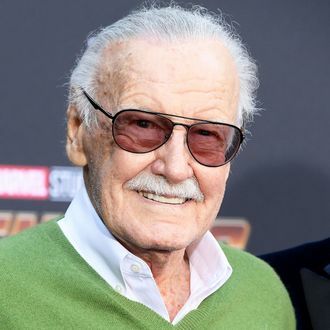 Marvel comics icon Stan Lee died this morning, his daughter confirmed to TMZ. The 95-year-old was reportedly taken from his Los Angeles home to a hospital via ambulance early Monday, where he was eventually declared dead. Earlier this year, Lee suffered a bout of pneumonia, and reports surfaced in the spring that claims of elder abuse were being made against people close to him. The famed comics writer, editor, and publisher was involved in the creation of many hugely popular characters, including Spider-Man, the X-Men, Thor, Black Panther, the Fantastic Four, and more. Celebrities who Lee has worked with and influenced are sharing remembrances of him. Iam so sad to hear that @therealstanlee has passed away! 😭 He left his magnificent stamp on our show @bigbangtheory_cbs in so many ways and we are eternally grateful .. I adored his visits, hugs and fantastic stories . He was an epic superhero and I will never forget him!! #stanlee 💫 excelsior!! Born before Edwin Hubble discovered the expanding universe, he ultimately created an expanding universe of his own - one of scientifically literate superheroes such as Spider-Man , The Hulk, Iron Man, & Black Panther. I want to share my final interview I did with Stan. He will be sorely missed and I cherish all the time I got to spend with him.